Raj Process Equipments is a process Equipments manufacturing company with vision to become one of the leading Indian Multinational Company in next decade. Through our continued efforts we are spreading our wings all over the globe. We are presently exporting to Italy, Ukraine, Finland, Indonesia, USA, Malaysia, Sri Lanka, Bangladesh, Oman, Qatar, Bahrain etc. We plan to expand in domestic as well as international market by setting up strong local support by setting up marketing offices & representatives. Our expertise is in providing turnkey plants for Distillery, Detergent, Starch & Starch Derivatives, Guar Gum, Zero Liquid Discharge Plant. 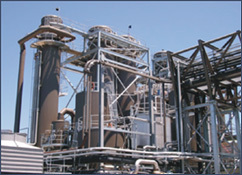 We are one of the leaders in Dryers, Evaporators and Blenders. We have recently developed import substitute for continuous mixer for coal impregnation and hydrocarbon recovery unit. We continue to develop new products and enhance existing products for better results. Home | About Us | Products | Enquiry Form | Contact Us Copyright © 2009 by Raj Group. All Rights Reserved. Jai Ganesh Vision, 'B' Wing, 3rd floor, Jai Ganesh Fame Building, Akurdi, Pune 411 035 (India).